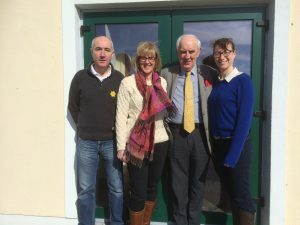 Pictured at the launch of the 5th Annual Clare Island 10K Run/Walk for Cancer are members of the organising committee: Padraic O’Malley (secretary); Sharon Fitzpatrick, Cancer Care West, Donal O’Shea (chairman) and Caroline Healy, Clare Island Manager. Ask any one of the hundreds of people who have taken part in the annual Clare Island 10k run/walk in aid of Cancer Care West and they will tell you that this 10k event is one that truly stands out in Ireland’s running/walking calendar. Whether it’s the short ferry crossing from Roonagh pier, the unrivalled welcome from the inhabitants of Clare Island, or the stunning scenery and Atlantic sea views, this event is one not to be missed. This year’s Clare Island 10k on Saturday, April 16, will be in aid of Cancer Care West- which offers free support to cancer patients and their families from all over the West of Ireland that relies heavily on fundraising and donations to meet the cost of these services. The entry fee for the run/walk is €38 and this includes the fare for the return ferry from Roonagh Pier, outside Louisburgh; tea/coffee and refreshments before the event; soup, sandwiches and home baking afterwards as well as water throughout the 10K route and race medals for every finisher. Enter online at www.cancercarewest.ie. All proceeds from the event will be donated to Cancer Care West and the funding of their residential and cancer support services. Further information about Cancer Care West is available from Rachel at [email protected] or by telephoning 091 545000.